Things are always interesting when a coil mattress can take sales away from memory foam and air mattress bedding, which is the case with this mid-priced mattress from Signature Sleep. 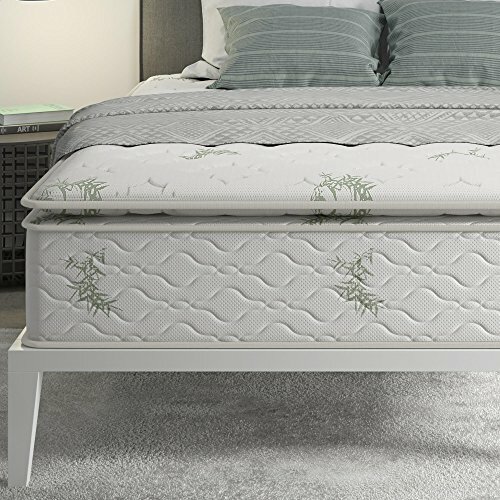 What makes this mattress stand out from the pack is that it is one of the newer coil mattresses with individually encased coils that act independent of each other. This gives it as close a feel to a memory foam mattress as you can get without actually getting memory foam. It also reaches a firmness level that is still comfortable and is hard to be mimicked by memory foam. Most people move to memory foam to get softer bedding, and even when looking for firmer solutions they still want a bit of a plush feel. With this mattress and its individual coils it caters to the crowd that wants a firm, tough mattress but isn’t quite ready to move to memory foam. There also isn’t the problem with encased heat that is present in memory foam mattresses, even in some of the gel versions. Coil mattresses may be on their way out, but if this mattress has anything to say about it individual coiled mattresses will be around for a long time. See Latest Price on Amazon Now! Signature Sleep is still the new kid on the block and has a lot to prove, especially when it comes to product quality. Signature Sleep is a branch of famed Canadian company Dorel, a more established and well known manufacturer of juvenile products, recreational products and home furnishings. Signature Sleep has yet to find its footing in the industry and as such it’s hard to put two and two together to realize that they are affiliated with Dorel. To go along with the company’s newness to the industry is possibly the worst warranty in existence for a mattress maker, as they offer only a 1 year limited warranty. It’s a bit of an insult to the consumer, but looking past that, in their lineup they have some very interesting products. They make one of the best individual spring coiled mattresses available and offer it at a fair price. Their memory foam mattresses however do not enjoy the same great quality, and are lagging behind a bit to the others in the industry. The company brands itself as ecofriendly, but is not as green as established companies like Brentwood Home. Even though it is an individual cased coil mattress, it is still classified as memory foam due to the 1.6 inch memory foam pillow top. The quality is not good at all for that sparse 1.6 inches, and in a way it interferes with what the bed is trying to represent as a sturdy and firm foundation. The saving grace is the quilted rayon from bamboo mattress cover which does an excellent job of drawing moisture away from the body, but since the memory foam pillow top is added on as what seems an afterthought then it makes it hard to recommend it as good memory foam. The pillow top uses older memory foam technology which means buyers will end up sweating through the night as it traps heat like an oven. It also seems to be blended with something else, but in the long run that does more harm than good since it just seems so out of place on this mattress. Available sizes are full, queen and king with the queen weighing a heavy 93.1 pounds with dimensions of 80x60x13. If buying this for the memory foam properties then it is best to avoid it and go get a dedicated memory foam mattress option. Amazingly the individual coils, of which there are 744, all independently encased. This gives a very memory foam-like experience but offers a certain firmness that can only be matched by coil mattresses. It’s very supportive, especially if using without the 1.6 inch memory foam top which just gets in the way. For consumers that appreciate a hard thick mattress, then this one won’t let them down. The pocket coils also have 13.5 gauge to support even the tightest back, and since the coils are made of tempered steel, that is more value to the consumer. This mattress inherits the lack of motion transfer known to be a big feature for memory foam mattresses, but it can be slightly off if there is a lot of motion on one side of the bed. Bamboo mattress cover did a good job of adding in some of their technology to the feature set, but it would have been so much better if they just took over the memory foam pillow top completely. Their efforts in a way are wasted on this particular model, but it still has merit for users that tend to sweat a lot in their sleep. This is one of the few products that doesn’t really have a comparable model by another competitor. The reason is many mattress makers have moved away from making extra firm coil mattresses, and if they do make coil mattresses they are made to be soft. In other cases they are coil hybrids, like this one fails to be. There are still buyers in the market that prefer a firm mattress over a soft one, and that is where this particular model will find most of its sales, if not all. There aren’t many firm mattresses that still operate on coils like this, so it has its place in the industry, albeit a very small chunk. This is not going to be a big seller by any means, but there are fewer and fewer places that customers can turn to when they want a heavy, firm mattress. Even the firmest memory foam can’t best this individual coil mattress in that regard, and lovers of memory foam wouldn’t want it to anyway. Individual coil mattresses will always have their niche market share and memory foam will continue growing its massive share. A long while back they had a sale on this that brought it in the low price range, taking off a good chunk. This is an online only item, so there will be a lot of sales from the various outlets it sells at. Besides directly from their website, they sell on Amazon and even Sears. But even so chances are the price will remain about the same, and may climb a bit as this is such a nice mattress. Don’t be surprised if they are stocked but the price has climbed by 10% in the next few months. There is a market for all types of mattresses, and the Signature Sleep proves that by showing that there are still customers will to buy firm coil based mattresses. The greatness of the mattress could’ve done a lot better without the cheap 1.6 inch memory foam pillow top, but as many buyers have noticed, it is as easy as throwing it away and then enjoying your new, firm mattress. Buyers of this mattress probably won’t be buying a memory foam mattress soon anyways, but it wouldn’t be out of the question. The only thing the company needs to do is to step up their game with the warranty and customers will probably become more plentiful than they can handle.